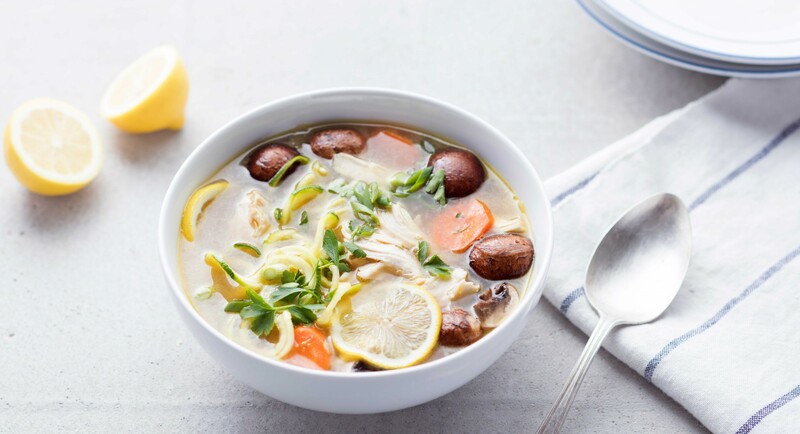 Whether you’ve found yourself in the middle of a busy week or are looking to lighten the load when it comes to cooking your next meal, one-pot recipes are a great way to enjoy a tasty, nutrient-rich dinner at home with fewer dishes to wash. We’ve rounded up our favorite one-pot meals—many of which can be made in under 30 minutes—along with some tips and tricks for effortless meal prep. As the name implies, one-pot meals only require one pot (or pan or cooking sheet) to cook, making them an easy, no-fuss weeknight meal with minimal clean-up. Plus, one-pot meals offer the comfort of a home cooked meal without the hassle or time of more labor-intensive recipes. Eggs: Perfect for scrambles or omelettes, get your sizzle on with a few eggs, veggies, and tofu or meat. Root Vegetables: Brussels sprouts, carrots, sweet potatoes, onions, leeks, and garlic are all ideal for roasting alongside a chicken breast or fish filet. Soups: Keep broth, veggies, noodles, and whatever you like on-hand to bring together in a simmering soup pot. Stir-Fry Recipes: Toss veggies (we like pea shoots and broccoli) with shrimp, tofu, or chicken, add an egg if you like and voila—dinner is served. Crock Pot-Friendly Recipes: Whip up everything from pot roast to mac and cheese by simply tossing all the ingredients into the slow cooker before heading out for the day. There’s nothing like coming home to a meal that practically makes itself. Put clean dishes away and do any dishes before getting started so you’ve cleared the way for easy clean-up. Keep food storage containers at the ready so you’re prepared to deal with leftovers after the meal. Work beside a trash or compost bin to easily discard waste. This works especially well when slicing or peeling vegetables. Clean as you go! Wash large or awkward items like bowls, cutting boards, or knives as you prepare your meal. Give your cookware a break and pull together a delicious dish with these one-pot recipes. Comforting and satisfying, this easy pasta combines meaty shiitake mushrooms, baby kale, and Parmesan with hearty rotini. This Southern-inspired dish has a plant-based twist with tender jackfruit, creole seasoning, chopped bell peppers, and a hit of hot sauce. Grab a cast-iron skillet and savor these eggs poached in tomato sauce spiced with cumin, coriander seeds, and red pepper. Don’t forget to top it with salty feta cheese. We love this Mediterranean twist on a traditional egg scramble using cherry tomatoes, zucchini, basil, and EVOO. This easy dish combines rice, boneless chicken thighs, and aromatics in a big pot and leaves it all to simmer. As the rice cooks, it steams the chicken to lock in moisture and infuse flavor from garlic, ginger, and green chiles. This lighter take on classic stir-fry pairs lime, chiles, and cashews with chicken for a nutritious mix of protein and vegetables that only takes 10 minutes. This simple but elegant recipe delivers tender, flaky fish in just 20 minutes thanks to a zesty blend of tomato sauce and balsamic vinegar. Looking for an easy recipe that yields impressive results? This quick one-sheet meal gets the job done with shrimp, broccoli, sesame oil, and red pepper flakes.